Hello, everyone! Hope you all had a fabulous Thanksgiving. We celebrated with my family last night and are celebrating with Tyler's family today. However, if you are heading out (or shopping from your couch!) for Black Friday, I've highlighted the best of the best below. I have included picks for both guys and girls so make sure you scroll through! J.Crew 30% off with code "HOLIDAY"
Banana Republic 50% off one full priced item with code "BRFIFTY"
Loft 50% off with code "TREAT"
Gap 50% off with code "BLKFRIDAY"
During a recent trip to Gap, I was immediately drawn to this sweater. The color is just so pretty and vibrant. It is perfect for the upcoming holiday season, too! It is a little longer, which I really love, because it would pair perfectly with some faux leather leggings. Today is the last day to enter the UOI Cozy Americana Cardigan giveaway! I debated back and forth for awhile before finally purchasing a blanket scarf. I felt like everyone had one already! After thinking about it, I realized I have never seen someone outside of my computer screen wear one. There are some things that are huge in "blog land" that are maybe not quite as big outside of it (or they just take longer to catch on outside of it). Anyways, they are not kidding when they call it a blanket scarf. When Tyler saw it, he said "Oh that is big enough for you to wear outside when you are cold and then take it off and use it as a blanket when you get inside!" He had no idea it was called a blanket scarf until AFTER that statement, hah! Don't forget to enter the giveaway for the UOI Americana Cardigan before you go. 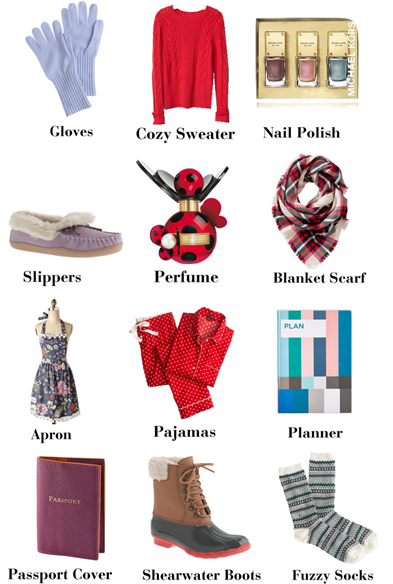 Today I am sharing my gift guide for her. I must quickly toot my own horn here, because I worked very hard on this graphic and am so pleased with how it came out! I tried to come up with ideas that were not super typical, but made sure to include some all-time favorites. 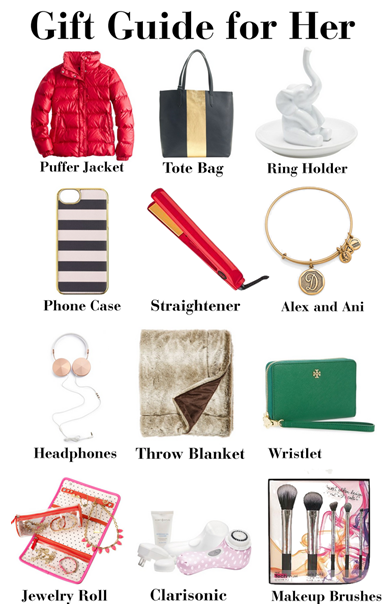 I love this gift guide because it can cover all the girls on your shopping list. For the beauty lover, I have chosen nail polish, a polka dot Clarisonic, perfume, a Chi Straightener, and new makeup brushes. For the fashionista in your life, there is a pair of Shearwater Boots, a cozy sweater, a plaid blanket scarf, a Tory Burch wristlet, and an Alex and Ani bracelet. For the techie, there is Friends Headphones and a new phone case. For the world traveler, I have linked a Graphic Image passport cover, a planner, a jewelry roll, and a tote bag. For the homebody, may I suggest a faux fur throw, a printed apron, a ring holder, or warm slippers? I hope you all found this helpful! Next week I will have my gift guide for him, so be sure to come back then for more ideas! Also, last week on Instagram, I asked my followers what the number one item on their wishlist was. I was pleasantly surprised by how many people said time with my family, a plane ticket home to visit my family, a date night out with my husband, a girls getaway, etc... so don't underestimate the value of a more personal gift :). Today's look is one I wore earlier this week. (You all got a sneak peek on Instagram!) I love the pink and navy color combo. The pink sweater really makes the navy Kendra Scott necklace stand out! Don't forget to enter the giveaway for the Americana Cardigan. If you love it, you're in luck! UOI has offered to give one away to one of A Memory of Us's readers! Enter using the Rafflecopter below. The more entries you complete, the better your chance of winning is! Today is the last day to enter to win $400 to Nordstrom. Details here. Today's look is one of my recent favorites! It combines so many of my favorite Fall pieces; wedge booties, a cozy sweater, and a wide brimmed hat. A trend that seems to be popping up everywhere is to wear a printed long sleeve top underneath a sweater. I am a huge fan of this trend! The subtle hint of stripes adds just the right amount of detail to this look. Most people are doing this with turtlenecks, but I have not jumped on board of the turtleneck train yet. It works just as well with whatever you already have in your closet! Also, you may notice that pretty much this entire look is from Old Navy. I don't normally shop there, but when I do apparently I buy one of everything :). This is good for you all because Old Navy currently has free 2 day shipping and 35% off using code CHEER. Today is the last day so don't wait to shop! It still is hard for me to believe that there are only six Mondays remaining before Christmas. It seems so far away! However, the calendar is not lying so it is time to start shopping or creating your wishlist. 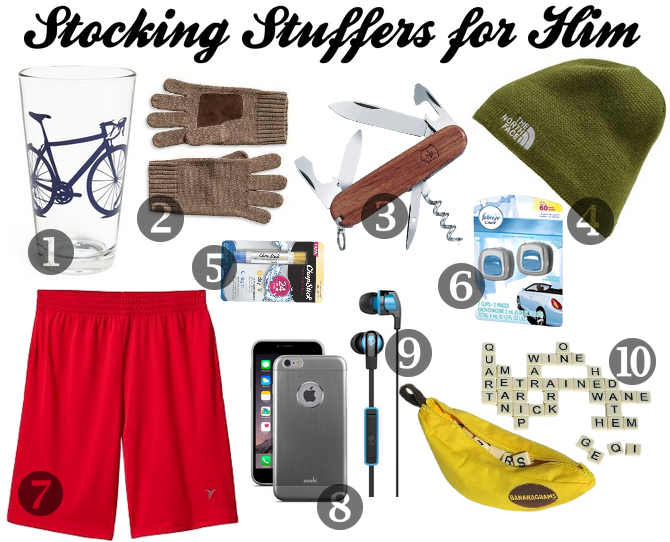 Below are some stocking stuffer ideas for him or her! I always think of stocking stuffers as smaller gifts... jewelry, cool weather essentials, lip gloss, etc. Santa always throws in some candy, too :). I have heard some people do their big gifts in their stockings and the smaller ones under the tree. Whatever your tradition is, I hope you get some good ideas for yourself or your loved ones! I will have more gift guides to come in the next for weeks, so stay tuned for more ideas! Have you entered to win $400 to Nordstrom yet? There are still a few days left... enter below! One of my favorite ones to take my dresses into cooler weather is to layer a shirt underneath them. (Evidence here and here). I love that it provides warmth but doesn't change the shape or fit of the dress. It seems crazy that last week I was able to wear a dress with no tights or coat considering it is now 30 degrees here! They think it will snow this weekend and I hope they are wrong, haha. Want to get a start on your Christmas shopping? There are some great sales happening this weekend! Kate Spade 25% off with code "BEMERRY"
Gap 30% off with code "HAPPY"
Bloomingdales 20% off with code "HOLIDAY"
J.Crew 25% off with code "SHOPNOW"
Hope you all have a great weekend! Don't forget to enter the giveaway for $400 to Nordstrom!